It is not a thrilled to bits feeling when I say Night Life of Bengaluru but do I really mean it? Agreeing to the fact that the city sleeps early and there is no permission for pubs or hotels to be open late night, Bengaluru is still a hot favorite for night owls. As it dawns and the world around us plunge to silence the craving for long rides, adventurous jeopardy, and an acute hunger hits its peak. You might have found your places but there is a list of after-dark activities and night out places in Bengaluru which we have pulled together for you on today’s article. Come, let’s explore and turn inside out to know the Nightlife in Bangalore and how awesome it could be. Night by itself is exploitive and sensuous to open your instincts and push you to that perspective of life which may not have come to your senses. If you are conscious and accessible to the wonders of dark then nothing can amaze you in a way that a laconic night does. The best way to enjoy the night life in Bangalore is to go out for an adventurous ride with your friends and crack the unresolved mystery of witching hour. If you are a person who is open to Adventure then we have few places which can quench your hankering for it. Skandagiri Hills has so much to cheer for nature lovers. It is known for After-Dark Trekking and climbing this hill in a chilling night accompanied by your gang of friends is an experience in itself. You can unlearn so many things and listen to the docket of stories, and all the emotions will embrace you but question is, Are you open for it? Skandagiri has located 70 km away from Bengaluru and its elevation above sea level is 4299 feet. Depending on your trekking skills Skandagiri can be traversed in 4-5 hours. One beautiful thing about going to the top of Skandagiri is the stunning sun rise that looks like Sun is sailing in the long thick blanket of clouds rolled in front of you. As the sun gets disappear in the sky and duskiness spread all over, take your gang of friends and go for one long ride to Devanahalli Air port. You can also take a Nice road and just drive the accelerator to the grooving music and to the sensory breeze of night. On the way, you can halt to satisfy your appetite for food at Dhaba, and tea stalls else food points at Air port are amazingly good. How awesome would it be to spend a whole long night in the backwaters of Manchanabele Arkavati River? It’s a kind of favorite spot for locals and indeed the safest place to drive to. It is just 40 kilometers away from the city which you can reach by Nice Road via Bangalore-Mysore highway. If you have a gang of friends who are totally crazy about you then river camp at Manchanabele will surprise you through its amazing facts of natural beauty. You can also opt for Bheemshwari Night Camp where you can enjoy your adrenaline rush and try activities like zip line, rope walking, Kayaking, and fishing. I don’t understand why there is a strong craving for food when there are hardly any options available in the city. Bengaluru might not be a city for night owls but if you are okay to get out of your house and ride a few kilometers then the city introduces you to few of the lip smacking food points that are God-sent for people like us. Bengaluru being the Pub city of India it is not a big deal to find the best pubs near you. However, with the recent Government rules imposed on Pubs being open late night, you may find it difficult to find one which is open during the night. If you are a party freak and love to spend the night dancing and grooving to the loud music of pubs then Bengaluru is still open for you. It is a classic British styled gothic European building that has hosts the mind blowing musical events which you can pre-book in book my show kind of websites. You can go alone or take your friends who love pop music to have some really good time. There are a bar and lounge to add some zest to your party mood. Where: No.40, St. Marks Road, Opp LIC Building, Bengaluru. Can you imagine yourself sipping Cocktails sitting on the rooftop of World Trade Center? Yes, High-Ultra Lounge is undoubtedly the best place to define the Bangalore nightlife culture. No words for the ambiance. Menu looks diverse and great. Get your feet moving on the ravishing dance floor of High-Ultra Lounge to have best of the nightlife in Bangalore. Where: World Trade Centre, Rooftop, 26/1, Dr. Rajkumar Road, Next to Orion Mall, Malleswaram, Bangalore. You can also make time for No Limits, Pecos, Toit, and Opus on palace road but none are open post 12. Not every day you can go out, right? So, how about doing some exciting things staying back at home? It is said that vibrations of the night are stronger enough to sprout your thoughts to ideas. Simply go to a meditative state and if you are an artist then nothing can match the silence of the night to produce the best of your creativity. If you are hungry then quickly prepare Maggi and relish it with a hot cup of tea. Have you slept under the sky and counted stars? It is one of my favorite things to do at night. Choose your preference and enjoy your own company. If you are alone and you are getting bored, obviously you are in bad company. So, this was our take on Nightlife in Bangalore. If you have something to share with us on this topic then please contribute your words in the comments below. Get the best of Metrosaga delivered to your inbox. 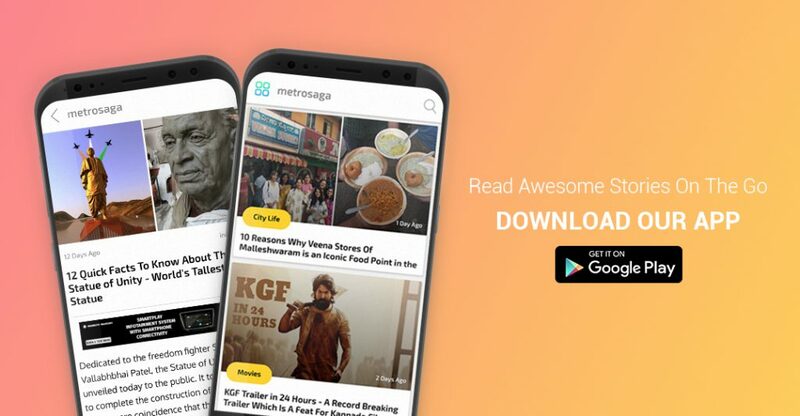 Subscribe to Metrosaga and never miss an another update from us.